Beth Winokur: Welcome Author Madeline Gornell! Thank you, Beth, for inviting me to your place! I certainly enjoyed meeting you at the San Bernardino Library Author event. I thought I’d talk a little about writing a series versus a standalone novel. Thank you Madeline, I really enjoyed meeting you as well. But mostly I am intrigued by your book Counsel of Ravens! Thanks for this insightful guest blog! In the dark of night, murder strikes on Route 66, and once again Hubert James Champion III finds himself having to face realities he’d rather run from. Indeed, within two days, Hugh finds himself embroiled in murder on a national scale, seeking justice for petty-crimes of a local nature—and very close to home, reviving his skills as a psychologist to help people who have become friends. Indeed, his friends need him. In addition, there are troubling mysteries of the personal kind still tucked away in the recesses of Hugh’s subconscious. He may still be “hiding out” in the desert, but East Coast ties continue to haunt and thwart his building hopes for the future. Many mystery authors write series, but for me, it’s been standalones until my latest. So, I’m talking about one little sequel, and that may seem like not such a big deal, but for me, it was huge. I didn’t realize how huge until about the middle of writing Counsel of Ravens. I’ve mentioned on blogs before how certain locations seem to reach out, grab me, tell me there’s a story there. And from that initial spark, my mind moves on to characters, plot, etc. Intertwined in that process—I think—is also a liking for dropping in on characters, not only at a particular spot, but in a particular point in their lives. Then drop out. Move on. Leaving all the “what if” possibilities in the rest of their lives unanswered and left to the reader’s imagination. Well, writing a sequel with Hugh et al., I’d have to deal with what came next, tie up some lose ends, even kick-start the next chapter of his life. At first, and for quite awhile in the writing of Counsel of Ravens, I didn’t want to do that. Doesn’t make much sense, but it’s true. It was hard making what I’m calling “second-wave” decisions for Hugh. And with that kind of mindset and difficulty, how could I possibly ever write a series, which was one of my initial goals way-back-when. And now, even with Counsel of Ravens published, I’m still not sure I can actually write a continuing series. Though, somewhere during the storytelling part of my latest I began to enjoy developing Hugh’s future, and his friend’s futures—including his ravens—who moved in this story from being reticent, to butting-in. And I did very much enjoy tying up the loose ends with a secondary, but one of my favorite characters in Reticence of Ravens—Marsha Portson. Which leads me to the “winding-road-of-writing.” My love of P.D. James’s style, her books, her protagonist, her approach to writing—led me to start off using M.M., wanting to emulate my rock-star author and because I planned on writing a series with a male protagonist—again, just like P.D. Beth, thanks so much for inviting me—loved being here! Your welcome please come back any time!! Thank you for your guest post and for sharing your wonderful stories! I look forward to reading Counsel of Ravens and the Rhodes! Madeline (M.M.) Gornell has five published mystery novels—including PSWA awarding winners Uncle Si’s Secret and Lies of Convenience (also a Hollywood Book Festival honorable Mention), Death of a Perfect Man, and Reticence of Ravens (a finalist for the Eric Hoffer 2011 fiction Prize, the da Vinci Eye for cover art, and the Montaigne Medal for most thought provoking book). 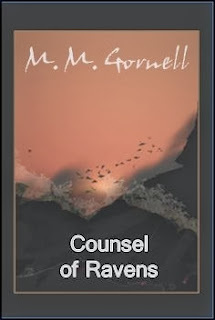 Her latest is Counsel of Ravens, her first sequel and a continuation of Hubert Champion’s Mojave saga. She continues to be inspired by historic Route 66, and expects to release in 2014 Rhodes. Madeline is a lifetime lover of mysteries, and besides reading and writing, she is also a potter with a fondness for stoneware and reduction firing. She lives with her husband and assorted canines in the Mojave High Desert near the internationally revered Route. Madeline, I agree that writing a series can be a challenge. There's so much to keep track of from one book to the next as you develop your characters. But I enjoyed "Reticence of Ravens" and "Counsel of Ravens" very much and I hope you decide to continue the series. Madeline, I believe unless you kill off all your good characters at the end, the possibility for a sequel is there. You don't have to ever write it, but you just never know. Doesn't hurt to have more than one winding road option ahead of you. Best wishes for continued success. Madeline, I so enjoyed your Hugh Champion character that I was happy to read the sequel and learn more about him. But I do understand your point about moving on, so I will look forward to your next stop along Route 66 since you do write locations so very well. Love all your books, Mad. Hugh Champion is aptly named. a great character. Hi, Madeline, good post. I love writing series--but there is certainly a lot to keep track of when you do. Nice blog, Beth.